The Consular Club of HCMC, whose members are from the various diplomatic missions in Ho Chi Minh City, will organize its 24th annual International Charity Bazaar on November 18, 2017 at the White Palace Convention Centre, 194 Hoang Van Thu Street, Ward 9, Phu Nhuan District. 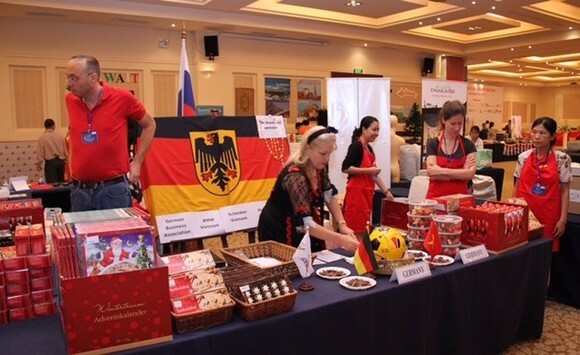 At the 24th International Consular Club Charity Bazaar, visitors will have chance to enjoy the festive spirit, food, and merchandise from all over the world, all while contributing to a good cause. The club said proceeds from the Bazaar will be used to help the less fortunate people of Ho Chi Minh City and the surrounding area. Projects supported by the Consular Club through funds generated from the annual International Charity Bazaar range from scholarships to medical care, providing fresh water, building bridges, schools and more. All Consular Club members volunteer their time to work towards improving the quality of life of the disadvantaged people in Vietnam. The event will begin at 9:30 am and run until 2:00pm. Entry tickets cost 100,000 VND for adults. People can also purchase tickets for the bazaar's popular raffle drawing. Raffle tickets are available for 50,000 VND each, and prizes include round-trip airline tickets, free stays at deluxe resorts and hotels in many famous locations throughout Vietnam, spa packages, lunch or dinner vouchers in luxury restaurants in Ho Chi Minh City and much more. Every prize in the raffle is valued at more than $100 USD. For further information on the Charity Bazaar (including limited advanced ticket sales and raffle tickets), contact the Consular Club at consularclub@gmail.com or the Consulate General of the State of Kuwait at 24 Phung Khac Khoan Street, DaKao Ward, District 1, Ho Chi Minh City, telephone: (+84-28) 3827 0555.